I went back a couple of days later to take some measurements of the giant pumpkin, bought 4 smaller pumpkins of varying sizes & we were on our way! What do you know / notice? Then I have them do a turn & talk with their group (visibly random groups of 3) to discuss what they need to a) measure, b) Google c) calculate in order to solve this problem. At this point we hit the end of the class period. Some groups had some volume calculations but none of them had got to (or really thought of) creating a table or a graph of weight depending on another variable to make a prediction. I was away this day & so students had the period to do some independent practice on Volume & Surface area word problems on Khan Academy. They found the line of best fit and quadratic curve of best fit. 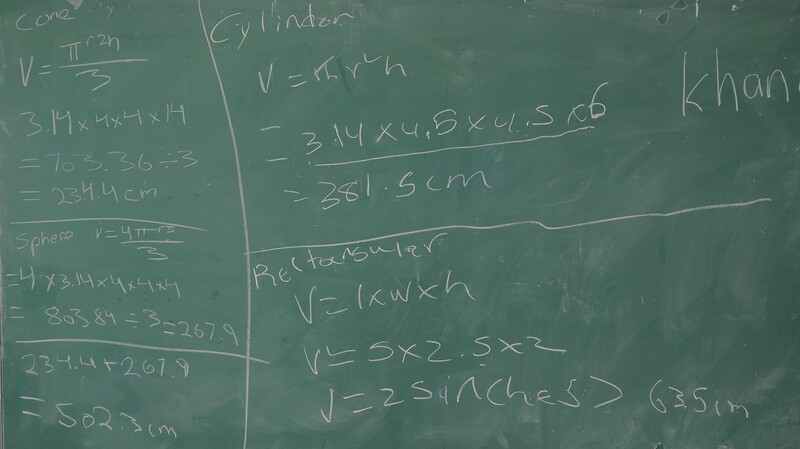 We had a class discussion about which one fit the data better … quadratic! I walked them through that first set of tasks step by step as a whole class making sure everyone understood. Then I turned the Desmos Activity to student-paced mode & let them continue the same graphing tasks for weight VS surface area & then volume (although many of my students gave up working on it once I was no longer leading the class through the activity slide by slide). Started class by revealing the weight of the giant pumpkin. DRUM ROLL PLEASE . . . 166 pounds!!! Students had the rest of the period to do some individual practice on “Graphing linear functions word problems” on Khan Academy. My folder with everything for this activity can be found here. The unassociated files are the Pear Deck interactive slide decks. From end of September, my “would you rather” styled ice cream problem. It’s not fully would you rather style, but it’s a good question prompt for this. The problem is probably mostly styled after Garfield Gini-Newman‘s “choose the better or best” style problems. Most students guessed the block would have the most ice cream. I had to answer questions about what the various formulas on their formula sheet meant. For example, many are unsure how to read V = lw + wh + lh and how to then use it, which operations to use, etc. Many groups did not notice the discrepancy in units between the various shapes. We had a discussion about converting units. 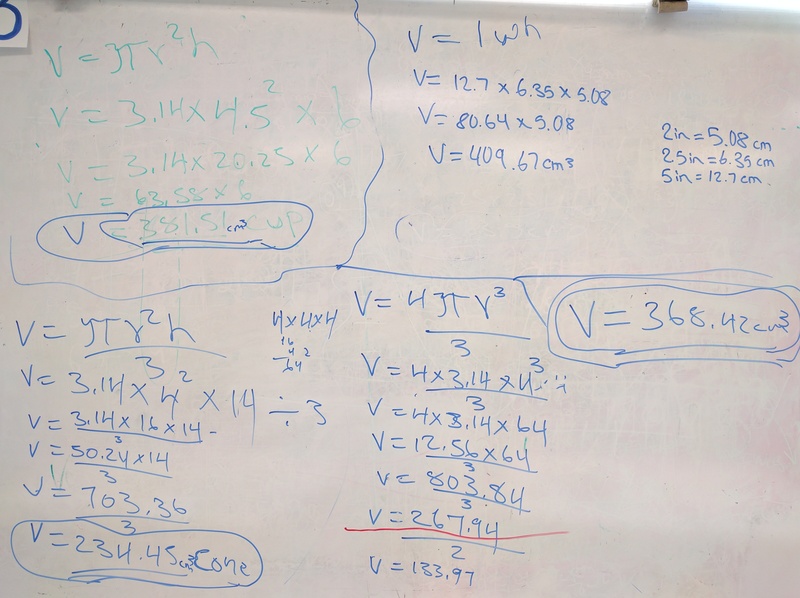 I did some direct teaching about how students tend to make less mistakes if they convert the lengths BEFORE calculating volume, rather than trying to convert cubic units (if calculating by hand). I sent students back to their boards to correct their work so that they have comparable units for each shape. First time I’ve done this one. I like it & will use it again w/ a few tweaks. This week’s activity is based on an old exam question that I now often put on one of our tests. And generally the kids are fine until they have to design a box that uses less cardboard than the original. Most of them leave this totally blank (I usually tell them I will not accept their test until they at least draw a box and label each side with a measurement). The part here that trips them up on the test is the fact that you need to use Pythagorean Theorem to find the height of the triangular base for the prism that makes the roof. Most make the (false) assumption that it is also 5cm. No problems here, really, since a rectangular prism is one of the easier solids for working with surface area. I remembered that last year it took my students a really long time to draw & fold these. I thought it would be better this year. Wrong. It took a full 75 minutes for them to draw 1 net, copy it onto a 2nd sheet (each student needed to build 2) & fold them both into place w/ tape. Also, I think next time, it would be beneficial to do this part 3 first. Build a model & then ask them to estimate the volume. So that they can see its size in real life. I’ll do that semester 2. This is the part of the test that they have so much trouble with. But given the model houses as manipulatives, they can really envision the dimensions of the box. Also they’re working in groups of 2-3 which always helps the problem solving process. As always, here is the link to all of my materials for this lesson. Today’s activity was designed to target the surface area & volume expectation in my MFM2P course. I’ve done this one a few times in the past. 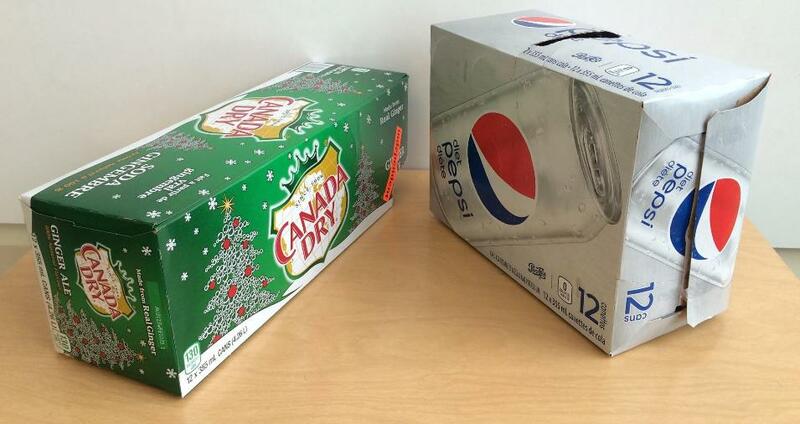 This time around I started by asking them to guess whether or not these two boxes had the same volume (I told them they both hold 12 cans – which is also written on the box): Over half of my students said NO – they were not the same volume. I sent them to their boards to check whether or not they were right. The volumes turned out not to be exactly the same, but we discussed that if we measured in cans, they both had the same volume; 12 cans. But if we measure in square centimetres, one had slightly more volume. So this spurred a quick discussion of being accurate in our measurements. The group working on the whiteboard pictured above used the formula from their formula sheet to calculate the surface area of the box. This group and others had initially misinterpreted the formula, adding instead of multiplying dimensions, etc. I called groups back to their boards, discussed how to “read” the formulas & asked them to revise their work. One of our 5 groups tried to solve by calculating the area of each face of the box: You can see their volume work from earlier at the top of their board. their surface area work is messy but towards the middle you can see them calculating the length x width of each rectangle. On the left they are multiplying those answers by 2. It doesn’t look like they got to the point of adding them together. I called attention to the 2 different methods used by the class; surface area formulas VS summing the areas of the faces (working with nets). 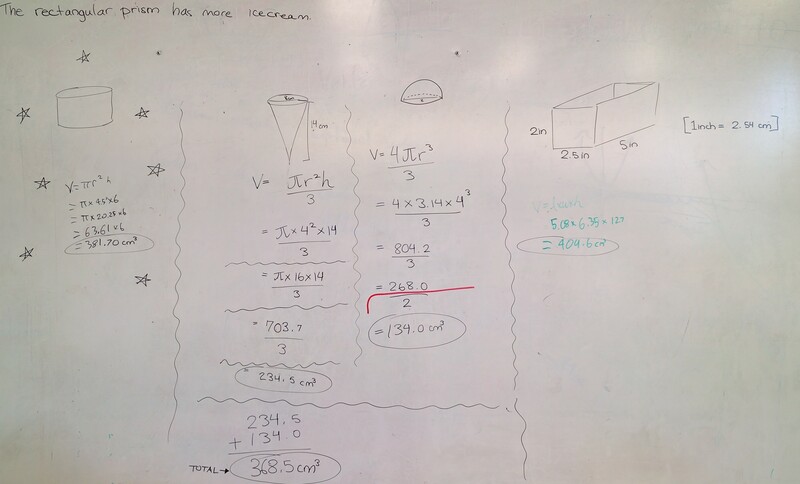 or Surface area (for the 4 students that have already mastered the previous exercise). I circulated helping students get started on their homework. In Dan Meyer‘s 3 act math, the 3rd act is checking if we are correct somehow. Lately, the 3rd act in my class has been more about the metacognitive task of discussing their various strategies in solving the problem. Does that make the activity less powerful if we don’t physically check if we modelled correctly after? 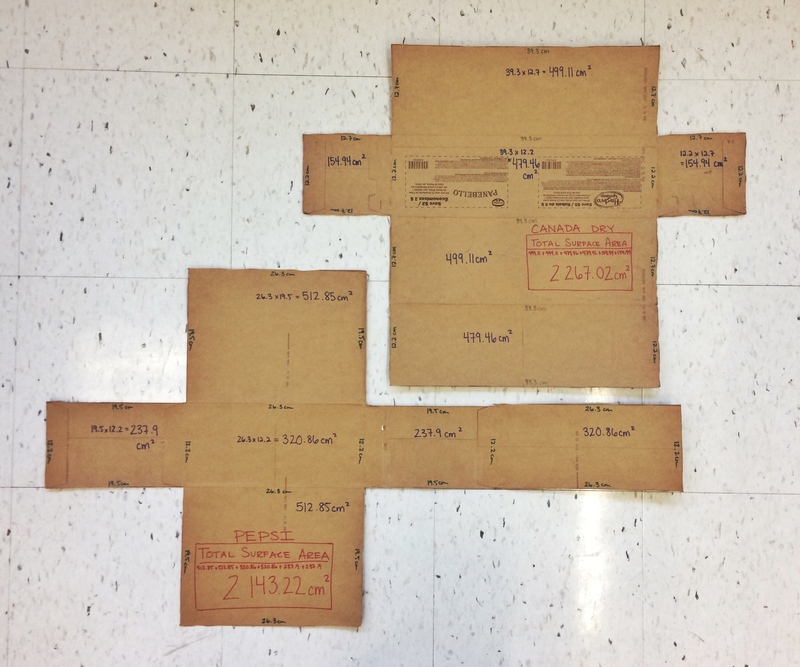 Perhaps I need to create the act 3 as a photo or video where I lay each box out flat as a net & show the surface area of each. Or should I cut them up to rearrange them into similar shapes to get the visual impact of which one has a larger surface area? Next time I’ll add that in. All the materials for this activity are here.